Mowing/Watering Tips | Gro Green Inc. Does Your Lawn Need Water? 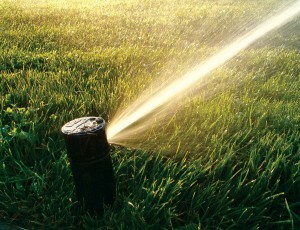 A symptom indicating that your lawn needs water is loss of green color. When you walk across the lawn, the grass remains flattened in the foot prints. The inability to penetrate the soil with a screwdriver indicates dry soil. Deep and Infrequent Watering is Best. Light and frequent watering produces a weak and shallow root system. A shallow root system cannot withstand dry heat or extreme cold temperatures. Watering at the proper depth allows depp healthy roots to ensure heat and cold temperatures. Healthy roots, produces a green healthier lawn. Measure the water by using a measuring device with flat bottom and sides, like a tuna can. Place the measuring devices on the lawn. Turn on your sprinklers and check to see how much water was measured. Once you have determined how much water is measured then you can adjust your watering to achieve the proper amount needed. Our clay soils do not absorb water very well. It may be necessary to water in cycles. First determine how long a cycle can water before the water begins to run off onto the sidewalk or the street. If you are irrigating for 14 minutes and the water seems to be running down the street, them back the time down to 12 minutes and so on. If 15 minutes seems to be working, you may increase that time and use less cycles. How Often and When to Water. The first rule of watering is to water when possible. The best time to water is early in the morning after the sun begins to sie. Watering at this time will help to reduce evaporation as well as reduce the chance of disease. To determine how to achieve your optimum watering per week, follow the example listed. Winter: 1 inch of water if no precipitation within two weeks during dormant periods. The roots of your lawn are still alive while the tops looks dead or dormant. Spring: 1 to 1 ½ inches of water per week if no precipitation as the turf begins to start growing. Fall: 1 to 1 ½ inches of water per week if no precipitation as the growth of the lawn begins to slow. If you turn on your sprinkler for 10 minutes and measure the water at ¼ inch. You will need to cycle your sprinkler 4 times that day to achieve 1 inch of water. By starting the cycles over at the end of the last cycle, the water will have time to soak into the soil. Run your sprinkles 3 or 4 times per week to achieve the desired amount of water needed. For Fescue Lawns you may need to run the sprinkler during the heat of the day in the summer for one cycle to cool the grass down. This is not necessary with Bermuda or St. Augustine Lawns. Using the repeated cycles method you can water your lawn and conserve water at the same time. This will help you to achieve the necessary water you need per week. Mowing can play a large part in watering your lawn. Make sure the mower blades are sharp. Dull blades will tear the grass instead of cutting. Tearing the leaf blades causes the lawn to lose water. It also gives the lawn an overall brown appearance. 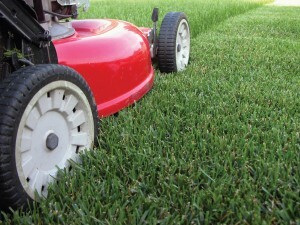 Mowing frequency is also important not to cut off more than a third of the lead blade at any moving. This can cause the lawn to lose moisture and stress the turf. Mowing height is important to maintain a green healthy lawn. Scalping is cutting the lawn very short in the early spring and the removal (bagging) of the dormant grass clippings. The dormant grass acts as insulation during the winter months to protect the roots. Removal of the insulation will allow the soil to warm and green up the lawn quicker. Fescue lawns do not need to be scalped. Scalping can be done after our last frost, usually after March 20th. The following mowing heights are recommended during the growing season. Keep the lawn mowed shorter in the spring to promote growth and thickening of the lawn. As temperatures begin to heat up then raise the moving height. During the heat of the summer the lawn should be mowed at the highest recommended cutting height to help the grass retain water. Aeration is a process that extracts small cores of soil from your lawn. This allows water, air and nutrients to penetrate your root zone, and reduces soil compaction. The result is a lawn that responds better to watering and treatments scheduled for the lawn. Aeration should be done twice per growing season for maximum effectiveness.